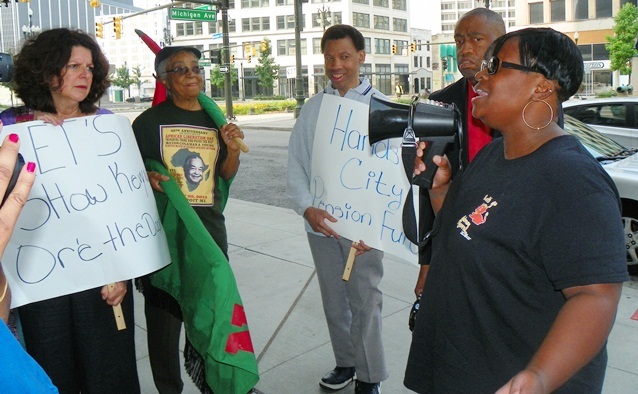 DETROIT JOINS NAT’L COALITION TO CALL FOR MORATORIUM ON SCHOOL CLOSINGS; RALLY WED. AUG. 28 @ 3 PM/ DPS HQ FISHER BLDG. 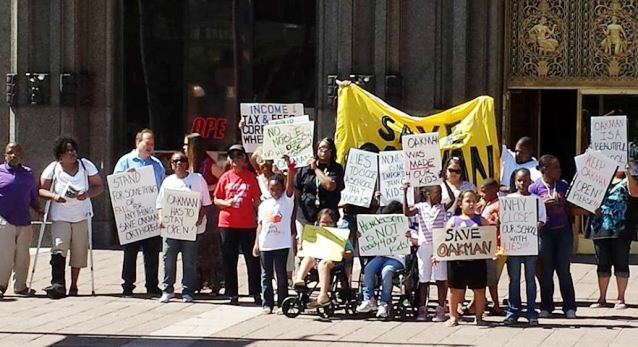 Rally to save Detroit’s Oakman Orthopedic School from closure, at Fisher Bldg. July 24, 2013. 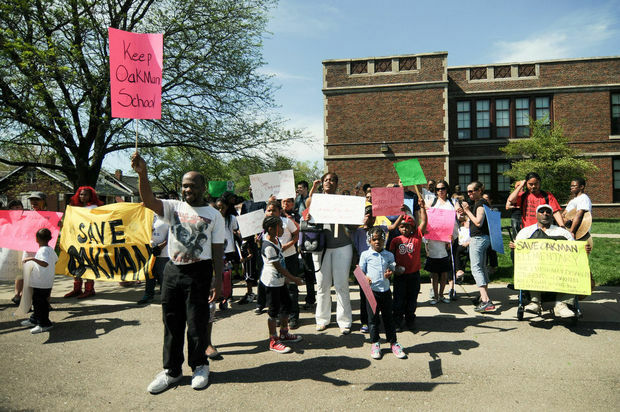 DETROIT – In light of school closings throughout the country targeting low-income communities of color and led to school deserts, Detroit will join a national 25-city coalition to call for a moratorium on school closings, turnarounds, phase outs and charter expansions. 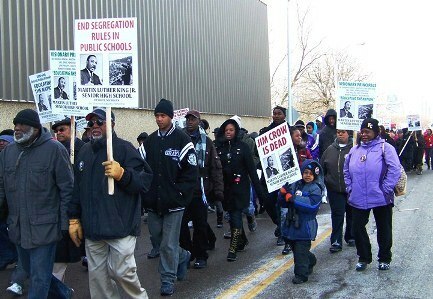 MLK Day March in Detroit from Dr. Martin Luther King, Jr. High School, 2011. As the nation marks the 50th anniversary of the March On Washington, Journey for Justice (J4J) members’ agenda is similar: racial justice and equal opportunity for all children – regardless of color, class or community – to a quality and safe education. students; and do not deliver improved academic performance of displaced low-income students of color. failed intervention strategies for struggling schools. have not improved student outcomes. WHO: Hundreds of students, parents and community representatives from across Michigan are expected to join Detroit’s “Education as a Human Right Day” on Wednesday, August 28th, in coordination with national actions with our following allies across the country: -Oakland, Calif.; San Jose, Calif.; Los Angeles; Hartford, Conn.; District of Columbia; Atlanta; Miami; Chicago; Wichita, Kan.; New Orleans; Baltimore; Minneapolis; Camden, N.J.; Englewood, N.J.; Paterson, N.J.; Jersey City, N.J.; Newark; New York; North Carolina, Boston; Eupora, Miss. ; Jackson, Miss. ; Philadelphia; South Carolina. WHERE: Wednesday, August 28, 2013 3 p.m.
WHY: A clear pattern of documented racial and economic discrimination has demonstrated that while there have been advances in the nation, as shown by the election of the nation’s first Black president, the federal administration’s policies have embodied education strategies that continue to perpetuate racial and class bias and support inequality in the quality of education. Journey for Justice is a national grassroots alliance whose goal is to bring the voice of those directly impacted by discriminatory school actions into the debate about the direction for public education in the 21st century and to promote equality in education for all students and sustainable, community-driven school reform for all school districts across the country. Earlier this year parents in 10 cities filed Title VI Civil Rights complaints with both the U.S. Department of Education and the U.S. Department of Justice. Former DPS Emergency Manager Roy Roberts could at times be disarmingly candid. One of those moments came in April, as he unveiled the district’s new strategic plan. Closing more schools every year, he acknowledged, was a losing plan. 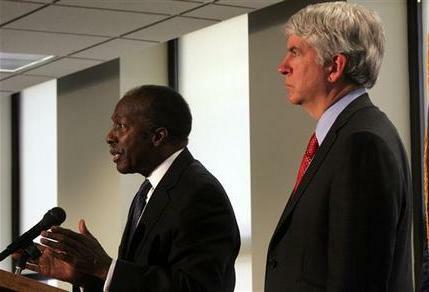 Roberts, who had unparalleled authority over DPS affairs, didn’t fire his team. Instead he set the district on a new course. Since 2009 DPS Emergency Managers had taken more than 100 schools off the books. Now he was reversing course. Only four schools– not 28– would be closed. And these would be the last. But Roberts’ seriousness in his decision to close at least one of those schools, Oakman Elementary/Orthopedic, is hard to discern. 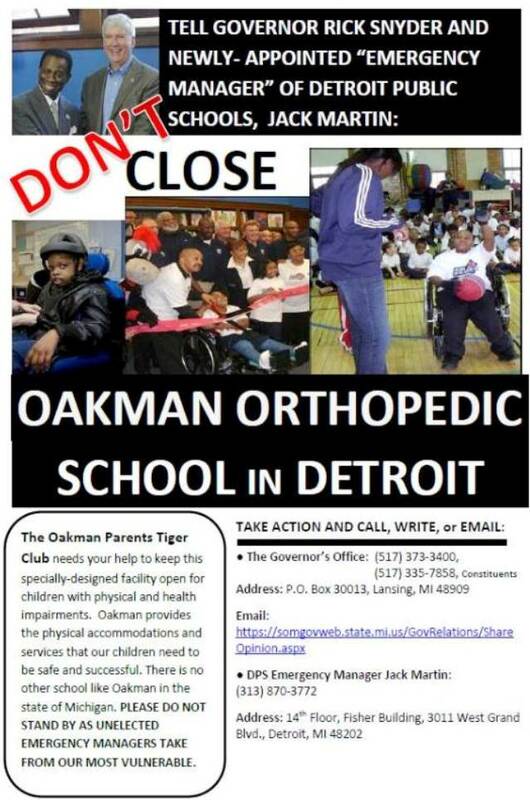 Oakman serves approximately 300 PreK to 5 children, about 40 percent of whom have special needs. Because special and general education students comingle from their first day of school, young children grow up seeing the humanity in each other. This goes a long way to eradicating the fear and stereotypes that lead to stigmatization. Protest organizer Helen Moore of Keep the Vote No Takeover at rally outside Oakman School May 15, 2013. The school’s distinctive features include accessible entryways, a single floor layout, rooms for performing diaper changes and catheterizations, and a wheelchair accessible greenhouse and playground. School personnel form a tight-knit, loving community of professionals who take tremendous pride in every facet of the school. But the district has been unable to substantiate any of these claims. 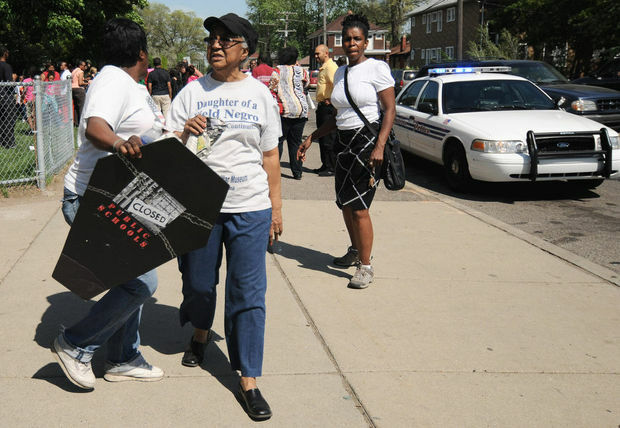 Oakman parents organization chair Aliya Moore addresses July 4 rally outside Detroit EM Kevyn Orr’s home in the Book Cadillac, demanding indepence for Detroit and for its schools. DPS Board members Elena Herrada (l) and Rev. David Murray (2nd from r), along with Helen Moore were among participants. 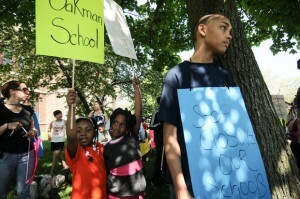 Enrollment numbers for Oakman are readily available on the DPS website. Rather than declining 50 percent, enrollment has actually increased since 2009, when it stood at 265. 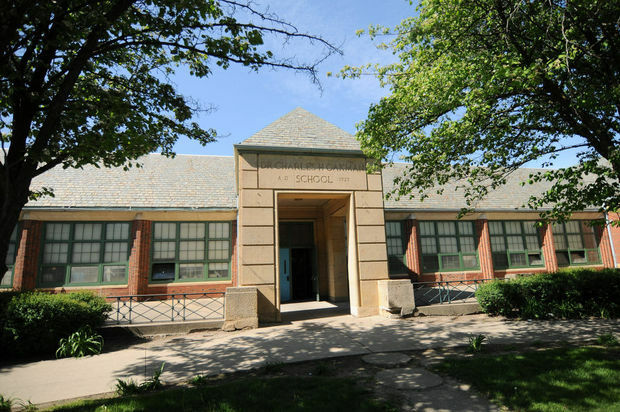 DPS in 2003 determined the school’s capacity to be 290. With an official enrollment of 288 today, the school is operating at 99.3 percent capacity, not 50 percent. The district maintains that the building capacity is now 446, even though neither the square footage of the building nor the composition of its student body has changed. School leaders, who were never consulted in increasing the school’s stated capacity, surmise that the district has simply inflated the number by over 50 percent by assuming there are no classrooms for students with physical and other health impairments in the building. By law, such classrooms are capped at 10-15. My Freedom of Information Act request for the district’s rationale for increasing the stated capacity was answered with a single line on a single page stating the school’s present enrollment. 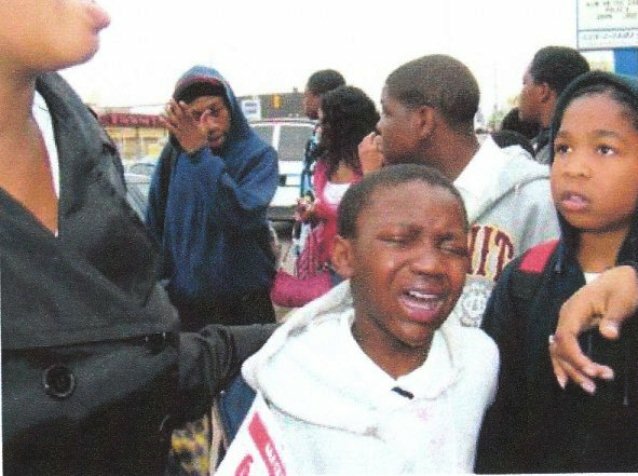 Students after police pepper spray atack during 2007 protest against school closings outside Northern High School. School personnel also dispute the estimated $900,000 in needed upgrades. My Freedom of Information Act request for an itemization of the needed repairs was answered, again, with a single line on a single page stating the current annual operating costs—and no itemization of needed upgrades. When I informed the district’s Freedom of Information Act coordinator that I had not received any of the requested information, which by law the district must provide, she told me that I was welcome to file an appeal. For now I’m filing a different sort of appeal, publicly and directly, to incoming Emergency Manager, Jack Martin. Mr. Martin, we need a plan for the district to win, not a plan for failure. Please revisit your predecessor’s unwarranted decision to close this commendable school.